Great that you got the opportunity to visit this temple, and in the process informing us about the temple. The picture of the gopuram in the backdrop of the sky is quite good! Adiyen. Adiyean Dasan. Please do visit the Divyadesam when possible. Thank you for making us to understand Shri.varahakavacham in its originnal form . All credit to the Swami who recited the mantram and the swami who translated in english. I am living in Pondicherry and soon I will visit this temple as soon as possible. The picture of the Gopuram is amazing. Whenever I am blessed with a chance to visit any Divyadesam, I will mostly post about it here. The blog can be followed through e-mail, Facebook, Twitter for updates. You may also pls click on Divyadesams section under Categories in the Left side of the page to see posts on various Divyadesams. I am sorry. But is it one of the 108 temples ? I do not think so. Please attribute the source of your information for making it a part of the 108. Its a part of 8 swayam vyakta kshetras. Thanks for pointing out the errata. As far as I searched in the net, it doesn’t seem to be. The magnificent temple and the engaging stala purana made me think of it as a DivyaDesam. Please do point out any errata in any articles. 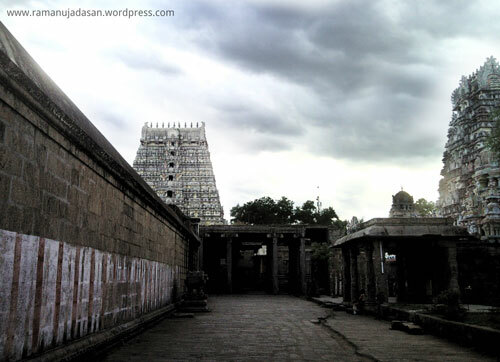 For a Kovil to be classified as a Divya Desam – there are criteria established by Azhavars. There has to be a pratyaksham of Thirumaal by ancient rishis/devatai , mangalasasanam by azhavars and a pushkarini and a vimanam. At least one azhavar Thirumangai azhavar has paid visits to majority of divya desams. So there has to be at least one mangalasasanam by him to Thirumaal for that Divya Desam. Since Divya Desams cannot be created the number has remained a constant for a very long time. Thanks for the useful information. Please do share such information. All these temples have mangalasasanams composed by Azhaavars. With the grace of Narayana, me and my wife have visited 104 divyadesams and hope to complete the rest by early 2012. I have not been called yet by deity Buvarahaswami and hope he will do so very shortly. I will make the visit from Chennai just to visit this holy place and receive his blessings. Thanks for the inspiration through your article. It is wonderful that you had visited 104 Divyadesams. For your kind information, a reader has rightly pointed out that Srimushnam temple doesn’t come under 108 Divyadesams. But it is a Beautiful Kshetram nevertheless. Lord Vishnu resides in Srimushnam in three forms: the ‘Ashwatha tree’, ‘Nithya Pushkarani’ and ‘Bhoovaraha Swamy’. The temple cistern, the ‘Nithya Pushkarani’, contains water known for its medicinal value as a panacea. The Secound, ‘Ashwatha tree’, stands near the sacred cistern and is believed to have the beneficial effect of blessing sterile women with progeny. Meditation and chanting of the ‘Gayathri Mantra’ under the tree after bathing in the holy cistern are said to vouchsafe a place in the heavens. This is astothram (8), not comes under 108 divyadesam . This is 8 swayam vyakta kshetras. Like 1).SriRangam, 2).SRIMUSHNAM,3).Thirupathi,4).Vaanamaamalai,in south,and 5).Patrikhasram,6).Pushkaram,7).Naimisaranyam,and 8).Saaligram. Srimushnam located 35 kms from Chidambaram, Srimushnam, the famous Vaishnava temple of Bhoovaraga. This is one of the eight Vaishavas shrines. The image in the temple is self created (Swayam Vyakta) representing Varaaga Avataram. The front Mandapam called Purushasukara Mandapam built in the 17th century looks like a chariot with elegantly carved figures of warriors riding the horses and elephants.And Stone Chains appears on four corners , Different Danceses and different sound stone pillars. Srimushnum is one of the 8 Swayambu Kshetrams in India.This is a Prarthana Sthalam for childless couples. Both, who have bath in the Nithya Pushkarani, go around the Arasa tree 12times, offer milk and fruits to small kids.This is also a prarthana sthalam for the unmarried. Lord is also said to help devotees in the purchase of house and car.Srimushnum Bhoo Varaha Swamy is the only temple that brings together such unity between Muslims and Hindus and this event continues to take place to this day. Which is the even you are talking about ? which unites boths hindus and muslims.? In Maasi Magam Perumal goes near Chidambaram for taking bath in Sea. On his way he visits through a Thaikkal where an Muslim Jamin’s Samathi is there. So muslims from those area offer Lord a Green Salvai and others as a gesture continues for years. It is believed that once this Jamin wa sfacing severe stomach pain and some one suggested to have the darshan of Sri Yagna Varaha who is on the way to Kalalaadi. Immediately his stomach pain vanished and there after he become the Bhaktha. So Hindu Muslim unity continues since that time. You can hear many named as Boorasahib, which is an extension of Bhoo Varaha. Vanamamali perumal , Nanguneri had the oil well. pujari told oil will come out it self and do the oil abhishekam to god for one month. focus more on this..
Swami, I don’t think Srimushnam temple has an Oil well like Vanamamalai. Please correct if adiyean is wrong. நானும் என் மனைவியும் சமீபத்தில் ஸ்ரீ முஷ்ணம் ஸ்வயம் தேசத்திற்கு சென்று வந்தோம். ஆகா என்ன அழகிய கோவில்.ஸ்ரீ பூவராகவ சுவாமியை பார்த்துக்கொண்டே இருக்கலாம் போல் உள்ளது. தாயாரும் அப்படியே. எவ்வளவோ துன்பங்களுக்கு இடையில் சென்று வந்தது மனதிற்கு ஆறுதலாக இருக்கிறது. True Swami, the very sight of Bhoovaraha Swamy and Ambujavalli Thayar offers divine solace to disturbed hearts. Adiyean was blessed to experience it too. From Chennai, which is the best route for coming by car? can you please suggest. I would like to visit the temple along with my wife and son. I am unaware of driving directions, but managed to find a couple of routes using Google Maps (link below). Hope you find it useful. Many thanks Shri Ramanuja Dasan. Many more thanks for this article , keep it up good job May good bless you..
2.What other Vaishnava temples around Srimushnam could be Darshand..
Swami, The nearest railway station would be Vridhachalam. You can also visit Kumbakonam (60kms from Srimushnam) and visit the Divyadesams there too.